It’s important that your child finds their own path in life. If you choose a career and future for your child, you run the risk of them becoming depressed and disinterested with their life. 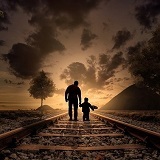 Therefore, you should help guide them toward a future, but remember that your child gets to decide what that future is. Embrace the child you’ve got. It’s not your job to tell your child what they should explore, study, or do for a living. See, value, and love the person they are; don’t focus on the person they’re not! When your child is young, listen for clues so you know which direction to guide your child in. What are your child’s talents and interests? Help match them up to the world’s opportunities and needs, and support your child’s effort to explore purposeful directions. Encourage your child to find the world on their own, but help them understand their options. Don’t go overboard with the freedom. As a parent, you must find the balance between telling your child what to do and letting them run wild. Accept that your child’s future is theirs, and commit to always supporting them, even if they don’t make the best decisions. Notice who your child actually is, and focus on what they truly love and what they’re actually good at. Don’t push them into activities they have no interest or talent in. Use diagnostic tools such as the Clifton StrengthsFinder test to help you explore your child’s strengths and weaknesses. Be interested and helpful, and help them find a mentor outside of the home. Keep in mind that your child needs to find their own path, so hang back a little and let them explore the world on their own.